In this tightly wound story, Lo Blacklock, a journalist who writes for a travel magazine, has just been given the assignment of a lifetime: a week on a luxury cruise with only a handful of cabins. At first, Lo’s stay is nothing but pleasant: the cabins are plush, the dinner parties are sparkling, and the guests are elegant. But as the week wears on, frigid winds whip the deck, gray skies fall, and Lo witnesses what she can only describe as a nightmare: a woman being thrown overboard. The problem? 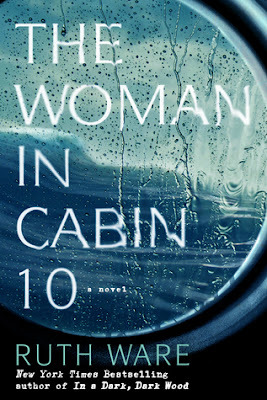 All passengers remain accounted for—and so, the ship sails on as if nothing has happened, despite Lo’s desperate attempts to convey that something (or someone) has gone terribly, terribly wrong… With surprising twists and a setting that proves as uncomfortably claustrophobic as it is eerily beautiful, Ruth Ware offers up another intense read. This is one of the first books I've read that was not recommended to me by someone I know and trust. I was in the library one day, saw this novel on one of their "Read Now!" shelves, and was hooked by the description. Who doesn't love a good mystery? Who wouldn't love an intriguing story with a cast of characters stuck on a cruise ship? The only problem: there wasn't a great cast of characters. Now, don't get me wrong, there were a bunch of folks on the ship, but I feel like they weren't given any justice. When you're reading a great mystery (especially one that some reviews have compared to Agatha Christie's), you want to feel like every single person is a suspect. You want to get thrown off your game time and time again. Unfortunately, that's not what happened here. We met all of the characters, but there were really only two or three that stood out as actual suspects. I wish the author would have taken the time to flesh out the characters' stories more -- to make me believe they were the guilty ones. Overall, the book had a good concept, but I don't think it was executed well. The mystery's resolution (which I won't tell you) was just unbelievable to me. I didn't actually believe that what happened in this book could actually occur in real life. And finally, I'm all for flawed protagonists, but come on. Our main character, Lo, is jam packed with flaws. There are just so many that I feel like, in real life, if everything that happened in the book happened to her in real life, she'd be huddled in a corner crying. Not the kind of heroine I'm looking for. This book has gotten rave reviews, and I'm sorry to be one of the few dissenters. But did you read the book? What did you think?